Or, rather, he'll run into you. Agent Siegfried Cohenberg has been bumping freighters for years. He's good at it. Aldur Aldent > what do you want? An Obelisk pilot named Aldur Aldent made his way into the Sivala system, right next door to Uedama. He must've heard that it was dangerous, so he remained at his keyboard. But he failed to purchase a permit. Aldur Aldent > thats a really good reason. Aldur pretended not to know why he was being bump-tackled, so our Agent sought to test the carebear. Aldur Aldent > how much? Aldur was given the opportunity to drop the facade, admit his knowledge of the Code, and confess his crimes. Instead, Aldur chose to disconnect from EVE. He hoped that by doing so, his freighter would emergency warp and automatically escape from the bumps. Aldur Aldent > if you can. Aldur Aldent > i would appreciate it. Five minutes later, Aldur logged back into the game, only to find that his freighter was still bump-tackled by Siegfried. But fortune smiled upon Aldur--he was contacted out of the blue by a courteous stranger, Amadeo Giannini. Amadeo Giannini > do you know how webs work? Aldur Aldent > yes. but i am not accepting a duel. you could be his alt. At first, Aldur was suspicious of the good Samaritan. For all he knew, Amadeo was Siegfried in disguise. Then again, that was unlikely. Their monocles aren't even on the same eye. Aldur Aldent > will webbing while being bumped work? Aldur Aldent > What webs do you need to do it? i have an alt i can bring in. Aldur was willing to at least hear what Amadeo had to say. Webbing his freighter seemed like the only escape from Siegfried's grasp. Still, he preferred to have his own alt do the webbing, rather than trusting a mysterious stranger to do it. Then something unexpected occurred--something that changed the equation entirely. Amadeo sent Aldur 10 million isk. You read that right: The stranger was giving 10 million to the freighter pilot, not the other way around. Aldur Aldent > ok. ill trust you. Aldur Aldent > what do you need me to do? Aldur Aldent > I uderstand. As it turned out, 10 million isk--though it may not sound like much--was just enough money to serve as a demonstration of trust and good faith. Aldur accepted the duel request from Amadeo. This allowed Amadeo to web Aldur's freighter without CONCORD interference. However, if Amadeo had different intentions, the duel would also enable him to destroy the freighter. Aldur Aldent > where did you go? "Amadeo Giannini > dont panic"
I love cliffhangers, i hope for the best. That's incredible. This wasn't a case of a totally oblivious hauler falling for the duel web trick, this guy knew that it was almost certainly a trick to kill him. 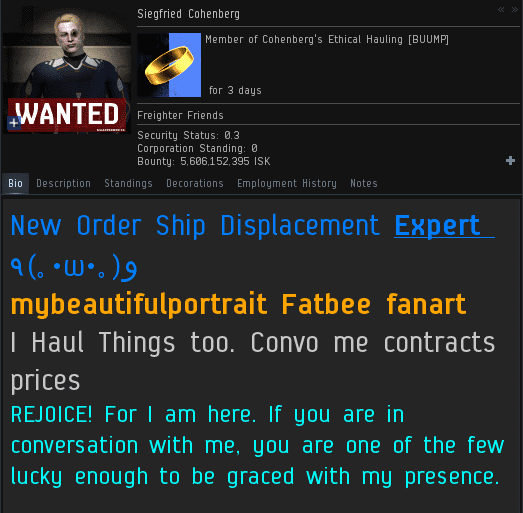 And yet he was so cheap that he'd rather accept the very high risk of losing his freighter than pay for a 10 million isk permit (and a small 300m isk bumping tip for Siegfried, of course). Carebears are so greedy it doesn't even make economic sense. I'm sure the carebear will receive a lesson so invaluable that he won't mind what it costs him. what happened next? was the freighter rescued by the webber, or is there a plot twist?